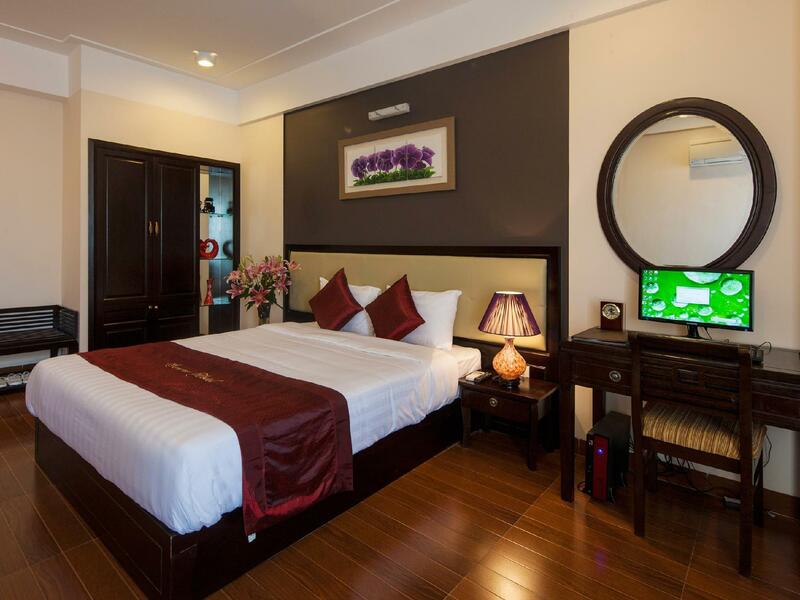 "All in all, this hotel was a great place to stay in Hue for..."
Have a question for Hue Serene Palace Hotel? "Very clean hotel, lovely large bedrooms, very comfortable bed, large bathroom with good pressure." "This is my second time with Hue Serene Palace and totally happy with the stay." "Really nice room and wonderful service." Nestled in the heart of Hue City, Hue Serene Palace Hotel is an ideal spot from which to discover Hue. 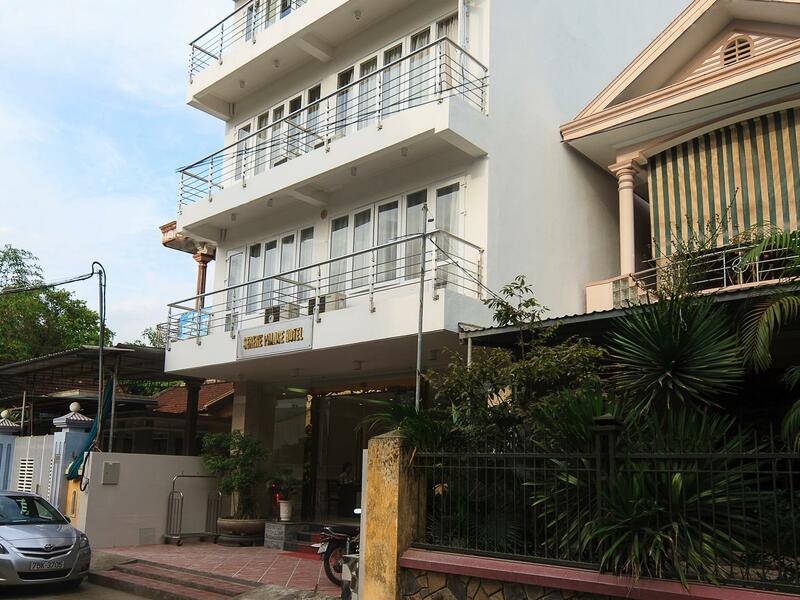 Situated only 0.2 Km from the city center, guests are well located to enjoy the town's attractions and activities. 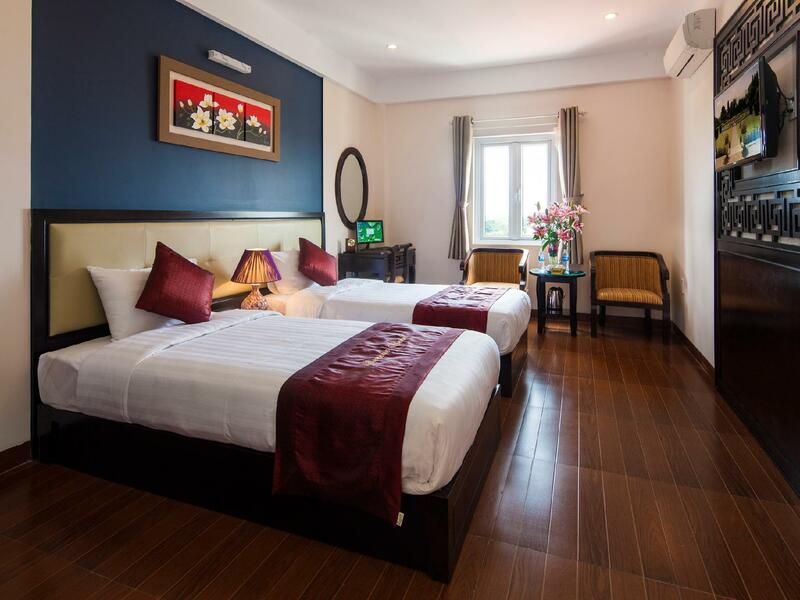 A haven of rest and relaxation, the hotel will offer total renewal just steps away from the city's numerous attractions such as Pure Silk, Gold Silk Fashion, Tinh Hoa Art Shop. 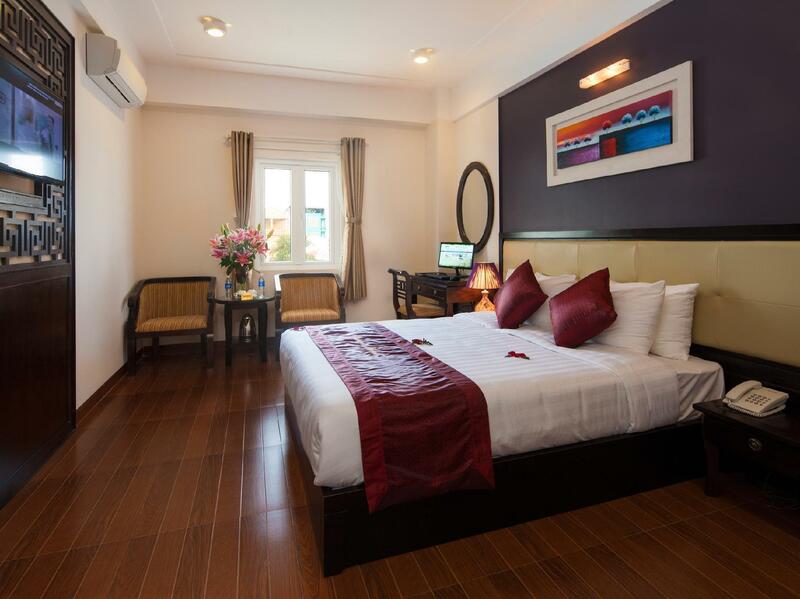 Offering hotel guests superior services and a broad range of amenities, Hue Serene Palace Hotel is committed to ensuring that your stay is as comfortable as possible. 24-hour room service, free Wi-Fi in all rooms, facilities for disabled guests, Wi-Fi in public areas, valet parking are just a few of the facilities that set Hue Serene Palace Hotel apart from other hotels in the city. 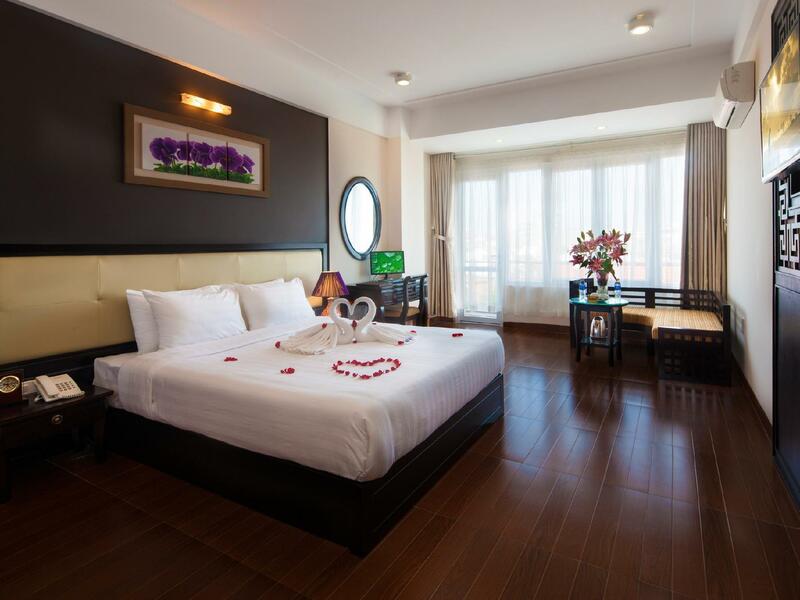 The ambiance of Hue Serene Palace Hotel is reflected in every guestroom. television LCD/plasma screen, internet access – wireless, internet access – wireless (complimentary), non smoking rooms, air conditioning are just some of the facilities that can be found throughout the property. Besides, the hotel's host of recreational offerings ensures you have plenty to do during your stay. Superb facilities and an excellent location make the Hue Serene Palace Hotel the perfect base from which to enjoy your stay in Hue. "The hotel itself was very good value for money, facilities m..."
This hotel was really surprisingly luxurious for what we expected for the price. Very spacious room, totally clean, amazing bathroom, ... located very central, restaurants, bars and sights in walking distance staff helped us with transportation and tour infos and we even got a lunch package ("fruits to go") for our one way motorbike trip to Hoi An (we can just highly recommend that!) very good breakfast buffet and a la cart definitely recommended for a short stay in Hue!! Great location in a quiet lane close to the backpacker area, very friendly staff, good breakfast, but renting windowless rooms without advertising it is a real shame. Was moved to another room, with a wall view. Avoid the cheapest rooms, you can get much better value nearby.. Overall an excellent stay, excellent service, really good food and we would recommend. We stayed here for two nights as part of our honeymoon. We were given an excellent welcome by Mary, given nice welcome drinks and fruit, a talk about the town and a map to get around. They had decorated our room very romantically and gave us a complimentary bottle of red dalat wine which was a really nice touch. The room was very well equipped and the restaurant downstairs served a very good breakfast with a decent choice. On the last day we were doing an Easy Rider Tour to Hoi An. We only had a small breakfast and the staff insisted that we take a packed lunch of fruit with us so that we didn't starve. It was a very nice touch and we felt well looked after. Without a doubt, this is the best hotel I have stayed in. Vietnam. The staff are courteous and helpful willing bend backwards to help. The rooms are spacious and clean. The location is near the weekend walking street, Citadel and the new Vincom Centre. There is an abundance of street food as well as restaurants in the locality. I would not think of living in another hotel when in Hue. Great place, beautiful staff. Food in restaurant just incredible. Try the fixed menu, a couple of the best tasting dishes I’ve had. Rooms large and comfortable. A big thanks for allowing me to take a shower before I fly out late in the day. Best place I stayed at during my 3 week trip through Vietnam. Very helpful friendly staff. One of very few places that actually give you all you can eat a-la-carte plus buffet for breakfast choices. Located in a narrow off-lane cramped with other motley bldgs is a big nuisance when it’s raining and wading through dirty water is necessary to reach the hotel. There is no need to inflated tours in Hue. All key sites if significant can be reached on foot or short taxi rides - cheap and easily available. No Grab though, but not a problem. Hotel is located close to walking street, ao really convenient to hangout at night. All staffs would make guests feel really welcome by their smiles and assistance. Love this. Room amenities are well arranged, 100% clean and perfect bedding for a good sleep. Highly recommended. Receptionist - very helpful. They are very kind, they offered me a quad room which has a large window and a balcony, even though I booked the cheapest superior room which does not have a window. (They say some have windows, some don't. It is recommended you request what you want, for example, a double or twin bedded, a bathroom with just a shower or with a bathtub, etc.,) I have never seen a room with a PC like what I am looking at right now. It's nice. Even though it is the cheapest superior room, what you need are all here. I can even find a scale here!! A fridge, a safety box, a kettle, a hair dryer, wardrobes, coffee&tea, some fruits... You are welcomed with some fresh fruits and juice too. 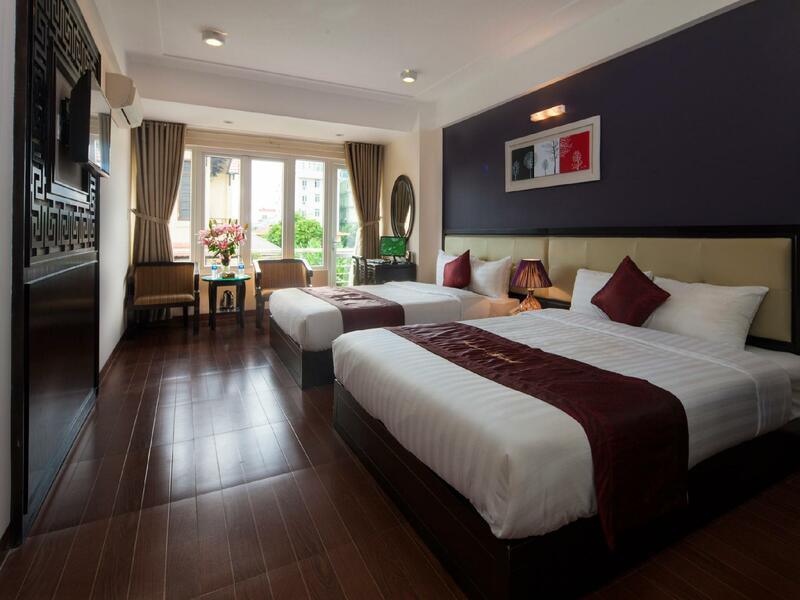 You won't regret to choose this hotel for your stay in Hue. *Its restaurant is chosen as the 1st prize among the restaurants in Hue by Tripadvisor. I can't wait till I try their meal tomorrow!! This place is incredible value for the money. The service, cleanliness of the room, and breakfast were all top notch. They even let us check in early after a terrible night on the sleeper train! The room is so nice and the beds and the most comfortable we've slept in in Asia. The restaurant attached does an incredible breakfast and the dinner and lunch they do is also very very very good. Most importantly is the service. Everyone working there is so kind and personable and willing to help with anything you need. Don't hesitate to stay here. It's worth it! Though the hotel is located in a small alley n looks unimpressive from the outside, the rooms were in excellent conditions (clean, spacious, new and comfotable). The front desk staff (in particular Alan) speaks very good english and gave great advice. Breakfast was good. Nothing we can complain about this hotel. Will stay here again if ever visit Hue! We had a different experience from most of the other reviewers and were rather unhappy with our stay here. We have been in South East Asia since January and stayed in varied hotels and apartments and none have been as loud as this hotel was. Pros: it's very clean, in a good location, the beds are comfy and the staff are nice, although the lady on reception was far too pushy with the tours. Cons: all the above mean nothing though when you can't actually get a good night's sleep. Our first morning we were woken up at 5am by loud doors banging and. Furniture scrapping. Get back to sleep half an hour later only to be woken up again at 7am by the room next door being made up. Really loud furniture moving, banging, constant noise until we left for breakfast at 8.45ish. The rooms aren't sound proofed at all so we could hear everything. We didn't say anything as we hoped it was a one off. Then the next night we are woken up at 1am by the guests upstairs coming home. You could literally hear them walking back and forth until around 3am. This is not the guests fault, but again the rooms are just not soundproof. Then, the following morning we are woken up by the works on the road outside and everyone in their rooms walking about. So we did not have a good night's rest either night, which is really the point of a hotel, so I would not stay here again despite the good points. Exceptional in every way. Staff wonderfully helpful and even provided me with some fruit for my journey, without my asking. Rooms are very spacious and clean with a computer monitor provided too. They also provide room service, fridge, and a hair dryer and comb for my bald head! Restaurant lovely food which is well presented. Helpful friendly staff always willing to help. New owners, they are keen to help out with planning day trips, arranging hired cars, even offering rain ponchos when it poured the day we left. Always smiling, they really made us feel at home. It helps that we were there in November, the slow season, but they really were lovely people to deal with. All in all, this hotel was a great place to stay in Hue for a couple nights. The value, location, customer service, and cleanliness were all excellent. My only qualm is that the shower head was falling off and had very weak water pressure. If that was fixed, then this place would be a slam dunk! Overall, I would definitely stay here again if travelling in Hue. The staff were helpful but was a little pushy about their packages for tourists. Overall the stay in the room was pretty good, all was clean other than the bathrobe and towels so its recommended you bring your own. Enjoyed our stay here. Our room was comfortable and good natural light. Breakfast had plenty to chose from. Good all round.